I’m an art lover from way back when. I love to draw, but I’m no expert, but this is an excellent book to help one obtain their dreams in art. This is a beautiful and colorful book with lots of sketches and instructions about how to draw and paint with color. 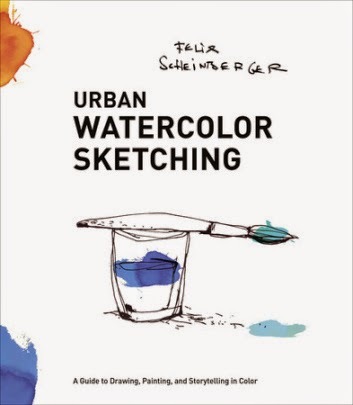 The author, Felix Sheinberger, an illustrator, artist and designer discusses the fundamentals like wet-on-wet, glazes and washer; Materials and supplies to bring on your travels and little know tips and tricks, like painting when water isn’t handy and seeking out inspiration. There is a great deal of discussion on the use of colors. If you are into learning or refining or just interested in drawing or painting with watercolors, this is the book for you. It is valuable and informative and excellent book to keep on your artist bookshelf. This is a valuable guide that shows one how to bring paintings and drawings to life with colorful, bold, yet accessible painting methods. FELIX SCHEINBERGER is an illustrator, artist, and designer. He is the author and illustrator of two other books on watercolors and has illustrated more than fifty children’s books in the last decade. His work has appeared in magazines including Harvard Business Manager and Psychology Today. He lives in Berlin, Germany. FTC Disclaimer: "I received this book from Blogging for Books for this review."